At last year’s Child Symposium the keynote speaker, Tamarack Institute’s Liz Weaver, encouraged participants to engage in a different kind of “R&D.” Instead of research and development, Weaver believes the most efficient and effective process of achieving impact is through “ripping off and duplicating.” In other words, why recreate the wheel when you can use and build upon that which exists and has experienced success? At Wyoming Kids First, we support the Weaver form of R&D. Wyoming Kids First works at both the state and local level. At the local level, we serve as a repository of early childhood information, frameworks, and resources and work to share these resources with early childhood stakeholders across Wyoming. The road to improved outcomes for children and families has already proven to be a challenging one, so we strive to share what we can and encourage communities to use or adapt existing resources and models to meet their unique local needs and challenges. Wyoming Kids First has been engaged in this R&D work informally since its inception. Recently, we created a page on our website to house the information, templates, frameworks and resources for the many successful early childhood programs and efforts. The webpage already includes resources for everything from the Book and a Bite program to readiness initiative materials to evaluation tools and continues to grow. We have invited stakeholders to share additional resources and are encouraging communities to utilize this wealth of information and resources in their work. Please contact us here if you have resources to share. Otherwise, check it out here. increasing your confidence as a provider, as well as your employer’s and parents’ confidence in your work! There are several ways to earn your CDA in Wyoming, including community college based CDA programs hosted by Laramie County Community College (LCCC) and Sheridan College, in-house employer training programs, or ProSolutions Training’s online program. Both LCCC and Sheridan College offer their programs online and are eligible for WY Quality Counts scholarships, which can cover the full cost of tuition, books, and other fees. Click here for more information or to download the scholarship application. LCCC’s next round of CDA classes start August 31, 2015. The CDA program is currently offered online during both fall and spring semesters. Students just need to have access to a reliable internet connection to participate. The training for the CDA takes one semester to complete. Students also earn seven college credits through this program, which can go towards an associate degree. Students who have not previously taken courses through LCCC have to apply and complete a brief online orientation. For more information, contact one of the following academic advisors: Chrissy Renfro (307-778-1310; crenfro@lccc.wy.edu); Ginny Ruckman (307-778-1130; gruckman@lccc.wy.edu); or Amanda Brown (307-778-4308; mbrown@lccc.wy.edu). WY Quality Counts scholarship applications for LCCC’s fall CDA course are due on Friday, July 17. Sheridan College offers an eight-week online CDA Seminar, in addition to an Infant/Toddler certification and early childhood certification programs. Each 3 credit online class is worth 45 STARS hours. Click here to register and scroll down to the middle of the page and under Sheridan click on apply now and follow the instructions. WY Quality Counts scholarship applications are available to support these programs. For more information, contact Autourina Mains (amains@sheridan.edu) or Tracie Pollard (tpollard@sheridan.edu). In addition to the community college programs, an in-house CDA curriculum—known as “CDA in a suitcase”—has been developed in Powell and could be replicated in other communities. CDA in a suitcase resulted from a collaboration between Park County School District #1 (PCSD #1), Northwest College, and state agencies. This one-of-a-kind program is provider-centric and offered on-site during work hours. Holly Howell, the PCSD #1 Early Childhood Liaison, was the trainer and educator for this program, delivering the CDA curriculum and offering help and support. In its first year, five providers graduated from the program and obtained their CDA certificates. In the effort to make this opportunity truly feasible for providers, the CDA tests are offered locally and WY Quality Counts funding is available to cover assessment fees. This program was designed by Autourina Mains, Northwest College’s Children’s Learning and Care Center Manager. For more information about this CDA program or to find out how to replicate this model in your community, contact Autourina Mains. A third option is ProSolutions Training that offers a 120-hour CDA course package, including all the coursework needed in the eight CDA Subject Areas. Through this program, the courses are available to you 24/7 and can be taken in any order and at your own pace. For more information or to register, click here. With several options to obtain a CDA and funding to support it, getting a CDA is a great way for early care and education professional to improve their knowledge, skills, and career. The realm of “as is” is clearly defined, organized, and leaves little question about…what is. In the realm of as is, we easily identify pieces, parts and roles. If we assess our work through the realm of as is, it’s quite easy to identify what we should be doing and why we’re doing it. 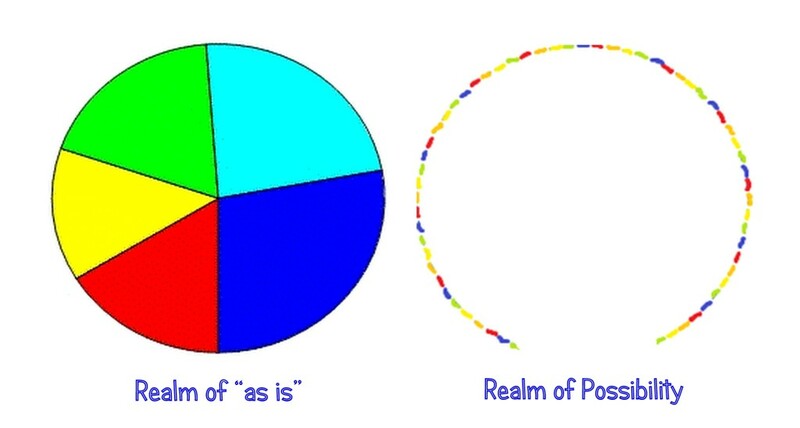 By contrast, the realm of possibility is a bit blurry and ill-defined. It has no clear boundaries. It does not specify pieces, parts and roles. If we assess our work through the realm of opportunity, we become possibilitarians and thought leaders. We seek that which is intriguing, challenging and inspiring. We enhance our existing relationships and build new ones. For me, summer represents a time to step out of the Wyoming early childhood realm of “as is” and into the Wyoming early childhood realm of possibility where we act as possibilitarians who thoughtfully consider our relationships, and the actions that Wyoming Kids First ought to continue, change, stop and start. I encourage you, too, to be a possibilitarian for young children in Wyoming, and invite you into the realm of possibility to help us identify that which we are best positioned to carry out to add value to your world, and to the one we all strive to make the best place to raise children, to work and to live. The Jackson School Readiness Project’s team of collaborators worked together for three years through a local coalition of organizations and individuals called Systems of Education (SOE) prior to receiving an Early Childhood Community Partnership Grant to support their work. SOE is committed to enriching out-of-school time for children. Through SOE, organizations, caregivers, early educators, preschool teachers, parents, and kindergarten teachers collaborated to locally define school readiness and the important roles that all adults in a child’s life play in preparing the whole child for school. The result was a “Getting Ready for Kindergarten” parent sheet in English and Spanish that emphasizes the importance of play, social skills, motor skills, and experiences that build literacy and language, math, and science. These areas form the basis of one part of the Jackson School Readiness Project. Facilitated by the Teton County Library, the SOE early childhood committee’s most active participants–Children’s Learning Center, Jackson Hole Children’s Museum, Teton Literacy Center, Teton Science Schools—formed the team for the Jackson School Readiness Project’s “Rolling Into Readiness” initiative, which is designed to emphasize the importance of parent engagement and influence parent-child interactions and home practices. Rolling Into Readiness takes parent and child activities directly into three Jackson neighborhoods with higher concentrations of low-income and Spanish speaking families through a distinctive “cat bus.” The activities are based on the areas described in the “Getting Ready for Kindergarten” parent sheet, along with a health and nutrition component. Each of the two events held this spring reached 70-100 young children and their family members. The key to Rolling Into Readiness’ success has been hiring and training six bilingual Community Mobilizers, who themselves are parents living in the targeted neighborhoods. Through calls and home visits, they encourage parent peers to attend the events by emphasizing information related to the event theme and explaining how it helps their child’s learning and their critical role as their child’s first and most important teacher. The Community Mobilizers have been instrumental in crafting messages that resonate with their community and structuring the events and post-event follow-up in a way that truly engages families. They have also been very effective in engaging traditionally hard-to-reach families: over half of the young children that attended the events are not enrolled in an early education or preschool program. The second part of the Jackson School Readiness Project is the CLASS observation initiative. CLASS stands for Classroom Assessment Scoring System and is a researched-based observation tool used to observe the quality of child-teacher interactions. CLASS provides effective feedback regardless of the curriculum used by the preschool classroom, and strong scores in some domains correlate with children’s future academic outcomes and progress. Fifteen local non-profit, faith-based and private preschool are participating in the CLASS observation initiative. The observer not only provides individual feedback and coaching to participating programs, but also will provide SOE with an overall view of the strengths and areas of growth for community preschools. SOE will use this information to identify professional development opportunities to directly improve the quality of child-teacher interactions in the community’s preschools. The Early Childhood Community Partnership Grant program provided the funding impetus to launch the two Jackson School Readiness initiatives on a broader scale. Through the grant program, the Jackson School Readiness team is engaging and supporting parents and preschools in making as many of the environments for young children enriched with opportunities to learn and grow as a whole child. Over the past few decades, STEM has been identified as the solution to the nation’s educational and professional shortcomings. The concept of STEM—shorthand for science, technology, engineering, and math—was created in the 1990’s by the National Science Foundation to focus on the subject areas deemed necessary to achieve individual and national success. STEM quickly took hold in education policy circles and after school program curricula. However, the past decade has seen a call to move from STEM to STEAM (STEM + Art). STEM fields focus on knowledge building and technical 21st-century skills. By adding art to the STEM curriculum or approach, students receive a more well-rounded education that can not only enhance student engagement and learning, but can even help unlock creative thinking and innovation. The art focus helps learners apply creativity along with knowledge in STEM challenges. Thus, the STEAM approach really focuses on empowering young learners to come up with their own ideas while exploring these subjects to be critical thinkers, problem-solvers, and innovators. The STEAM approach is particularly important in early childhood. Research shows the arts support early brain development and can help close the achievement gap for children! This is accomplished through improved language development, fine-tuned motor skills, and enhanced creativity and visual learning in young children–the link between early childhood and STEAM is undeniable. Early exposure to STEAM supports children’s overall academic growth, develops early critical thinking skills, and plants the seed for later interest in STEM study and careers. asking thought-provoking questions that engage children in critical thinking. You don’t need to be a scientist, engineer, or mathematician to incorporate STEAM-learning opportunities into young children’s lives. All you need to do is incorporate and extend simple activities in a way that encourages problem-solving, critical thinking, creativity, and innovation—it’s the best way to help children not only learn STEAM concepts, but to also incite a love of learning. ZOOMsci: Here you’ll find hundreds of experiment and activity how-tos, with feedback from kids and teachers who’ve tried them. SimplySTEM: Full of STEAM program ideas for kids of all ages, this wiki features contributions from students in an Association for Library Service to Children (ALSC) online course as well as librarians eager to share program plans. At a Natrona County School Board meeting in 2009 the question was asked, “What is the best predictor of high school graduation?” The answer was: a student that is on track in ninth grade is most likely to graduate. The obvious follow-up question, “Then what is the best predictor of success in ninth grade?” gave birth to a focused but ambitious partnership, now beginning its fifth year of operations, between the school district, the county library, and the Casper Star-Tribune and Casper Journal. The answer was reading at grade level in third grade. The three partner organizations together undertook the challenge to educate the community of the importance of reading to kids and demonstrating reading and early literacy as a community value. They designed and implemented a three-pronged program and raised hundreds of thousands of dollars. A marketing program employing the mantra to “Read 20 minutes a day to someone special” employed newspaper, radio, television, billboard, movie theater, digital and other advertising with the message. A recent poll found the messaging penetrated more than 90 percent of the community. A process was designed and funded to give each kindergarten through third-grade student a new book every month, including over the summer. In some cases, these are the only books students had in their home. Every student knew the free book represented the need to read. A special eight-page weekly family magazine, My Trib, is published and delivered to most homes in Natrona County, elementary schools, the Natrona County Library and its satellites in Mills and Evansville, the Boys and Girls Clubs and the Casper Recreation Center. My Trib helps early readers identify shapes, sounds and colors. My Trib offers ideas to understand one of the free books each week, including discussion points and related activities. Mini-pages offer age-appropriate literacy building thoughts and activities on a variety of appropriate topics. There are two serialized stories, one for early readers and another for families to read together. And a calendar offers ideas and information for families that would like to know about literacy events. As the program completed its fourth year, a series of focus groups and surveys helped the partners determine necessary adjustments to reach every possible early reader in the county. A paid Facebook campaign will be added next year, more digital advertising and development of a new feature-laden phone app is on the horizon. Funders of the project have been consistent, and the number of third-graders reading at grade level is steadily improving. To learn more about the We Read program and to check out their resources, go to their website here. There is a call for early childhood professionals who are interested in attending a Train the Trainer workshop that prepares participants to facilitate community events on the Wyoming Early Learning Guidelines (ELGs) and Wyoming Early Learning Foundations (ELFs). A partnership between Align, the University of Wyoming, Wyoming Kids First, and the Wyoming Department of Family Services created a Train the Trainer opportunity for sixteen early childhood professionals to be trained as community trainers for the ELGs and ELFs by UW’s Tiernan McIlwaine in May 2015. At the two-day event, professionals dug deeper into the content of both the ELGs and ELFs before considering how to share that content with early childhood professionals and families in their own communities. Participants said in their evaluations. This training highlighted [that the] ELFs and ELGs are intuitive for all of us. I will use learned information to familiarize [early learning professionals] with developmentally appropriate ways of teaching children with intention and assessing children’s development through observation. We practiced the skills needed to create an engaging learning opportunity for those we train in order to enrich their understanding of their child’s development. This was a very entertaining and informative training on the Early Learning Guidelines and Foundations. I got some great information, facilitation tips, and resources that I can use at our center. The tools provided [in this training] will be useful. I appreciate the opportunity for continued support through this process. What dates/times of the year will work best for you to attend a training? Where in Wyoming would you like a training to be held? Following an assessment of interest and timing for an event, we will proceed with planning and organizing the opportunity. There will be formal call for presenters and an application process once a date and time is identified. We look forward to working with you to thoughtfully share the Wyoming ELGs and ELFs! Though spring showers lingered into June, Wyoming’s summer season—full of abundant home-grown produce and farmers markets—is underway. This year, Wyomingites will likely see new faces and food items at their local farmers market as a result of the Wyoming Food Freedom Act—enacted on March 3, 2015—which allows the sale and consumption of homemade foods. The implications of this new law reach beyond the farmers market and into early care and education environments. As a result of the Food Freedom Act, producers can sell their food at a farm, ranch, farmers market, office, or any location agreed to between the producer and the “informed end consumer”–the last person to purchase a product who has been informed that the product is not licensed, regulated, or inspected. This means that individuals can purchase a variety of homemade and/or locally grown foods previously unavailable. However, licensed and inspected food establishments cannot buy homemade foods and products except for raw, unprocessed fruit and vegetables. Of particular relevance to early care and education environments is the new allowance for purchase of raw milk products. While individuals can now purchase unpasteurized milk for personal consumption, providers must still uphold the “safe food” rules, which means regulating what is brought into their space. Consumer Health Services (CHS) inspectors and/or local health department inspectors will be looking closely at all foods used in child care establishments to make sure they are all from an approved source. Ultimately, there are two important takeaways on the Food Freedom Act for early care and education providers. Providers can supplement their menus with fresh fruits and vegetables from the farmers markets—a wonderful healthy, fresh addition to young children’s meals. However, providers cannot serve raw milk and other homemade foods to the children in their care. To learn more about the Wyoming Food Freedom Act, click here. Wyoming Institute for Disabilities (WIND), through the Wyoming Family to Family Health Information Center (WY F2F), is working to create a parent mentorship program for Wyoming families who have children with Autism. As a part of this, WIND is recruiting families who have children that have been diagnosed with Autism and are willing to serve as mentors for families of newly diagnosed children. Are interested in developing a family network in Wyoming. Participate in monthly meetings with family mentee support as needed. These can be conducted via phone/video conference. Positions available: Family member representatives of children with autism. Support: Accommodations as needed, reimbursement for meeting expenses. Activities are visually driven to encourage sharing on social media. Additionally, twice a month, on dates listed on WYQC’s yearly calendar, the website and WYQC’s Facebook page offers visitors exciting, exclusive activities for a limited time. All activities have been vetted by early childhood development experts at the University of Wyoming, so parents and providers can be confident that play time is also learning time. 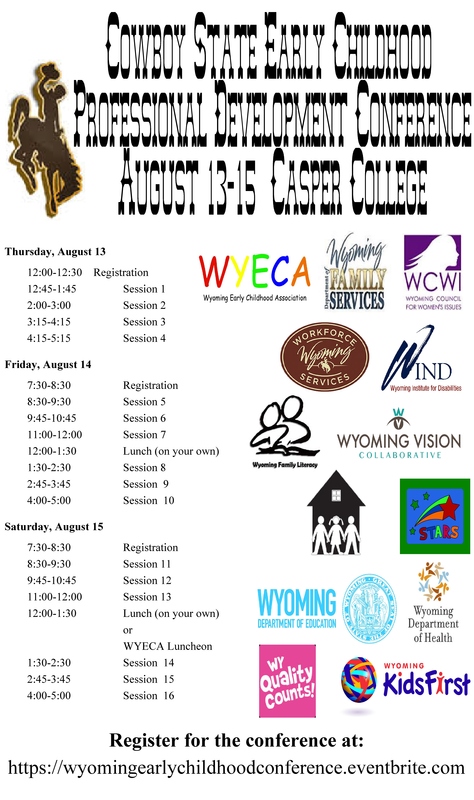 In order to connect parents and providers to Wyoming’s childcare resources, the website also features the WY Early Childhood Network, which offers a comprehensive list of the state’s many resources, including: state government organizations, support organizations for child care professionals, nonprofit organizations that offer assistance to low-income families, and Wyoming colleges and universities with early childhood programs. To request a calendar and join in the fun of the 2015 expedition, find us on Facebook or visit our website. WY Quality Counts is an investment in the future of Wyoming’s children. Find us on Facebook at Facebook.com/WYQualityCounts. A collaboration of early childhood organizations have worked together to plan and host the 2015 Cowboy State Early Childhood Professional Development Conference. This conference will offer three days of high quality trainings and workshops for early childhood providers. STARS credit will be offered. Click here to register or to learn more. Click here to see the conference session schedule. Stay tuned for the conference agenda. Wyoming Kids First will be presenting two workshops: “BaFá BaFá: A Diversity Simulation and Dialogue,” and “The 11th Principle.” Read the workshop descriptions here.